Nice ! Looking forward to ! Mega-Satellite to $888, its a freezeout, not rebuy..hmm.. I might consider to try this one. Hehe..
cianopher wrote: Mega-Satellite to $888, its a freezeout, not rebuy..hmm..
10 Qualified Seats + 2 Satellite Seats + 3 lucky draw Seats... Prize pool already hit SGD$12000 !! 15 players confirmed players, 3 places paid. Should be more than 15 players ... Bryan, Joshua, Nat, Tan W Y, Kaya, Johnny chan, Phil Ivey, and Tom Dwan also coming ..... ....... high roller event ... you know. I'm a new fish here, perhaps need some clarifications. so let's say the total players join the tournament is = 90 players. then they are divided into 10 tables (for example). so? the director will wait till only one person left in each table? or how? table 1 left 4 players, while table 2 left 3 players, table 7 left 7 players. lastly, could the player change to other table as they like? i hope the pokerkaki or support wont faint by my stupiak questions. 90 players are divided into 10 tables (9 handed). When first 9 players busted out of the tourney and left with 81 players, TD would order to break 1 of the table and the players on this broken table would join into the empty seats of the remaining 9 tables with a drew of table assigning card. Same process for total number of players go down to 72, 63, 54, 45 ....etc until Final Table. 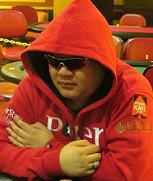 Dafa poker freeroll on 19th must be a player in Dafa poker rite? If not cannot join the freeroll? Not Like LWPS v where anyone can? Humm.. May have to download Dafa software soon liao if yes.. Anyway any Earlybird promotion for tix? I'm not very sure abt bounty event definition, can some1 explain? Bounty cash reward given upfront on eliminating a certain player/players? 1) The answers to your satellite questions all depend on the amount of entrants. We award 1 seat for every 6 entrants, so if there are 14 entrants for example, the prize money of the additional 2 players will be distributed as cash to the 3rd place. 3) Yes the blind structure will not be as deep as the ME. 4) Each player will be issued a token. If you bust a player you collect his token. At the end of the tournament you simply exchange all the tokens you've accumulated for cash. May I ask how long does a tournament usually last? For example, if I play a 2pm tournament, and let's say I make it to final table, is it possible for me to catch the 9:45pm ferry back to Habourfront Centre based on your experience? the final table takes place the following day (20/02) at 12pm.